Our stained glass windows came from a synagogue in Indiana. This detail represents the Ten Commandments. Stained glass based upon Temple Israel’s logo, which was designed by Thelma Rosner. On May 18, 2010, preceding the Erev Shavuot service, a new stained glass window was dedicated in memory of Rabbi Joel Wittstein. 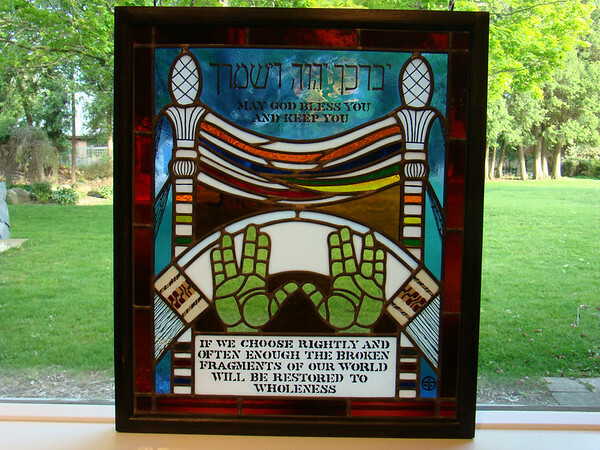 The development and design elements of the window, depicting themes from Rabbi Wittstein’s time of leadership at the Temple, resulted from a unique effort and spirit of collaborative sharing among the members of Ailene Wittstein’s long-standing book club who made the donation, the creative involvement of Ailene herself, and the artist Ted Goodden.